There aren’t enough cat videos on the internet. You know it’s true. So, video camera maker GoPro has set out to right that wrong with its latest ad. I have to admit, I love the GoPro. These amazing cameras produce amazing video. In this case, it’s of cats chasing laser pointers but, it performs equally well when strapped to a surfboard or, at 30 metres underwater. GoPro made underwater and adventure sports videos affordable for everyone. 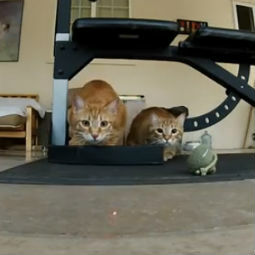 And now, with all this technology, cats get to show of their determination and athleticism when chasing a small, red dot across a floor.